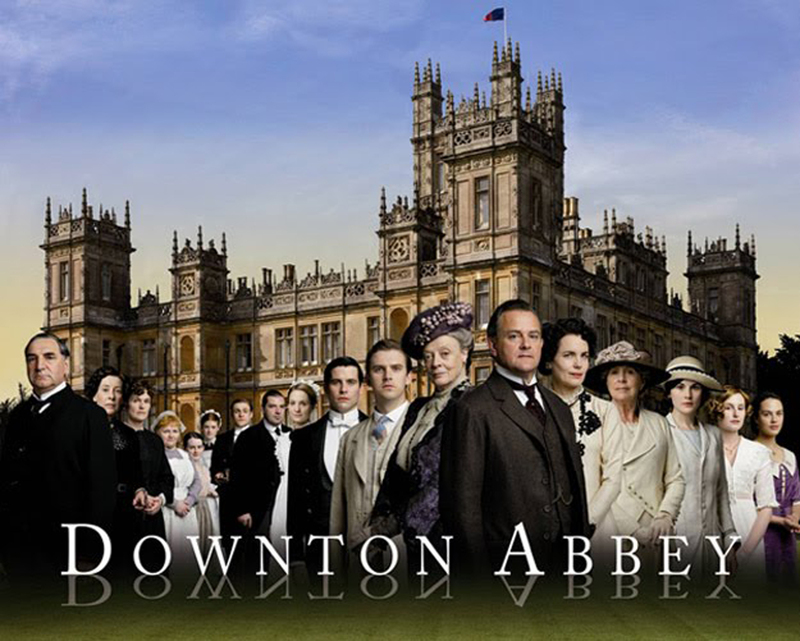 Downton Abbey Spoofs – A.K.A. Poor Mr. Bates! “Downton Arby’s” – Just the name is enough to start the smiles. Stars comic Richard Kind and is a favorite of Downton creator, Julian Fellowes. Of course, Thomas is up to no good and targets the unsuspecting Bates. “Uptown Downstairs Abbey” Parody – On screen interviews with cast members and writer/creator Julian Fellowes (not) keep it entertaining. 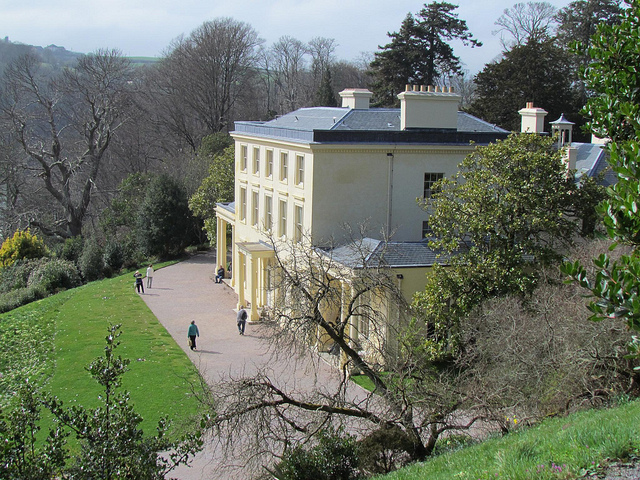 Bates takes a few unfortunate falls for the good of the order. Stars Kim Cattrall, Jennifer Saunders, and Joanna Lumley. And my personal favorite, the Muppets star in “Upside-Downton Abbey” – Adorable. But one is left with the question, what happened to the tea? (You’ll see what I mean at the end.) Sadly, Bates does not appear, but the interaction between the former Lady Grantham and Carson tease the funny bone. “If Downton Abbey Characters Were Played By Dogs” – The Downton characters as dogs. And one cat, since the dowager countess is “too uppity to be a dog.” Brilliant. Not to be missed are these wonderful drawings by Kim Parkhurst – “Downton Abbey as Dogs & Cats.” Incredible! Mrs. Patmore’s likeness is a hoot. These are available on Etsy for purchase should your drawing room require a tasteful, updated decor. 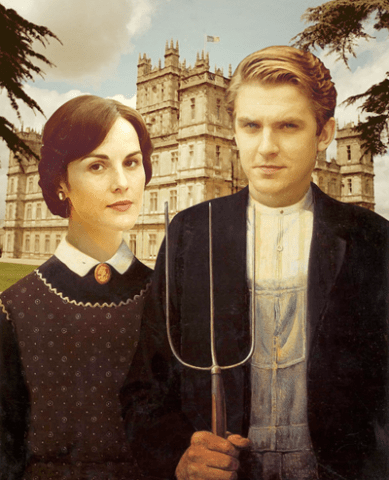 And who expected this Downton meets American Gothic portrait parody? Plenty of getting-Downton-fun for all. Enjoy. When I watched a particular poignant scene from the second season of Downton Abbey this week, it felt familiar. Do you remember…? Matthew, about to board his train back to war, is surprised to see Mary in the distance. She is up and about early, before the family usually arises, anxious to give him her good luck toy from childhood before he goes. Mary hopes it will protect him. Her only request is that Matthew bring it back home, back to her. He says that even if he doesn’t come back, Mary has made him a happy man, restoring their friendship. He looks as if he wants to tell her more and she seems expectant. Perhaps she is hoping for a declaration of love? Instead, Matthew asks if she’ll take care of his mother, should anything happen to him in the war. And his fiancé. Will she look after Lavina, too? Mary replies, “Of course” and leans forward, giving Matthew a tender, goodbye kiss on the cheek as befits a lady. Scarlet waits alone at the bottom of the staircase for Ashley to descend. She hopes to have a few private minutes with him before he goes back to war. When he finally comes down, Scarlet tells him she has a parting gift. She unwraps the package containing a yellow, fringed sash and gives it to him. It is made with Scarlet’s own hands. She ties it about him in a love knot. As she drinks in the last moments with Ashley, he asks her to promise him something. If anything should happen to him, will she take care of Melanie, his fragile wife and Scarlet’s perceived enemy? Scarlet reluctantly promises and asks Ashley to kiss her goodbye. She pulls him into an unseemly embrace. She is no lady. Hmmm. There is a definite similarity here. Wondering if anyone else had seen the same, I checked the Internet for articles or blogs about connections between Downton Abbey and Gone With the Wind. There were many. And they were published during the first season. So much for my literary insight. • Both had a cast of three sisters – the eldest the most beautiful and callous (Mary & Scarlett), the middle girls (Edith & Suellen) the least attractive and overshadowed by their older siblings , while the youngest daughters were both idealistic and wanted to make the world a better place (Sybil & Carreen). • Both eldest daughters were unable to marry the man of their choice – though the jury is still out for Mary & Matthew. • Both had American mothers and fathers from a foreign country – Irish Gerald O’Hara and English Robert Crowley. • Both sagas dwelt on the importance of family property and both fathers poured their souls into the land. • Both stories were set against a backdrop of impending war. There are other parallels noted online by various astute critiquers, but you get the idea. Still, knowing all this does not lesson my ardor for Downton Abbey in the least. I’ve already scheduled time for Masterpiece viewing this the coming Sunday evening. The answering machine will be poised and ready to take messages. My eye-glasses will be cleaned and tea will be at-the-ready. Perhaps the lesson here is this: if you are going to engage in fictional-thievery, then for goodness sakes, steal from the best!